Aaaaand we're back, after another whirlwind weekend! So nice to be home, though hanging out in sweatpants and doing laundry is quite a change of pace. 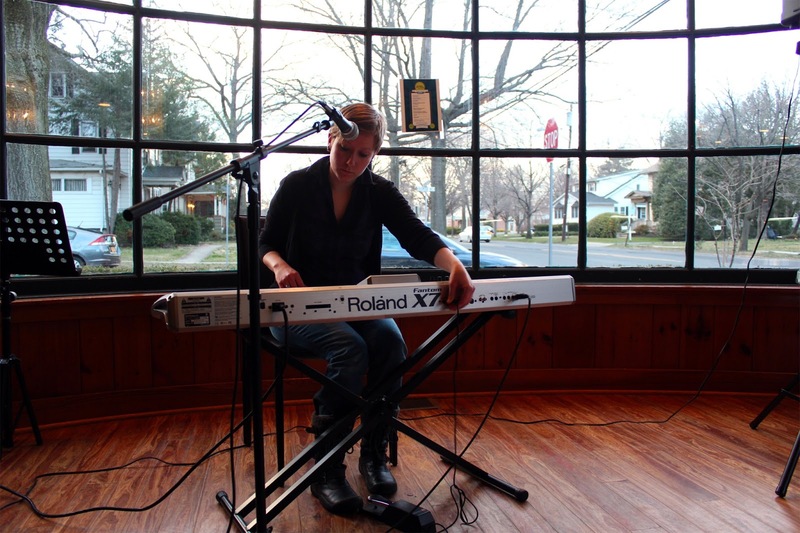 My first stop was Haddonfield, NJ, to play at Jersey Java and Tea. It's supposed to be a 90 minute drive, so I picked up my car (a tiny lightweight Honda Insight hybrid that gets rattled as larger cars speed by) around 3pm. We'd packed it up by 3:30pm and I was feeling confident we'd get there plenty early. But first I had to drive in Manhattan again. I have a weird inability to properly use my horn, so more than once Sam had to reach over and hit it for me, especially when I had to slam on the breaks because some truck misjudged his ability to pull out into traffic, but we got off the island little worse for wear (except that maybe I'd made Sam a little crazy). The drive through Jersey didn't seem that long, but it was 6:30 by the time we arrived at Jersey Java. Oops. I had 30 minutes for a quick soundcheck and to change out of my driving clothes. Then I'd left my makeup in the car and had to apply it in the rearview mirror and hope I didn't look like a clown. I started playing around 7 and it sounded surprisingly great in there! I pulled out some of my favorite "deep cuts" ("A Thousand Miles" anyone?) and played continuously for two hours. Some strangers wandered in and sat attentively on the couches facing my keyboard. One guy even stayed the whole time. The baristas offered to have me back, which is always a good sign since they don't have much choice in listening. Some friends showed up near the end so we stuck around after the show talking to them and drinking more coffee (I had more driving to do, okay?!). We left at 9:30 and scarfed down some lentil rice salad in the car before hitting the road again. I usually get pretty hyper after a show, but I was unusually hyper from the combination of adrenaline and caffeine as we drove down to Cape May. We jammed out to Marina & the diamonds and Ellie Goulding (and maybe Lady Gaga, don't tell) and I was bouncing in my seat, feeling pretty jittery and goofy driving in the dark. We arrived at the Merion Inn around 11:15 (again, 30 minutes before my set). I walked in with a pretty huge backpack on but the room was set up so that we would have had to walk right in front of the performer before me. So of course I backed up and completely knocked over the hostess's stand, disassembling a lamp and spilling all sorts of menus on the floor. It's not a party until Jana knocks something over, right? I was the last performer of the night, but the dozen or so people there were incredibly attentive (besides the couple making out at the bar, who were attending to each other). My friend Allison Tartalia from back in the DemoTape days was there, having played earlier in the night. I had different sets planned out for each night at Cape May, so this one was a combo of soft/pretty and super dark. I played a new song called "The Clincher" which I had thought was a bit of a weird one, but it was really well received. I loved that piano and that room. Sam ordered tea and the owner brought out a whole box of herbal teas for her to choose from. I ordered Coke which was actually RC Cola (more caffeine!!!!). I said hi to the other performers and then we headed to the hotel. We checked in at 1am and discovered that our hotel room was actually a suite with a full kitchen. The best use we made of it all weekend was to make ramen (actually a Trader Joe's rice noodle bowl, but you get the picture) which we ate that in front of the TV in our pajamas. We were both too wired to sleep so instead we watched Employee of The Month, me without contacts in (I'm blind enough that I couldn't really see anyone's facial expressions) until finally falling asleep at 3am. Getting out of bed the next morning was torture, but we dragged ourselves to Bella Vida Cafe where I could actually order a tempeh reuben with Vegenaise and a gluten-free wrap. Delicious! After that we drove around a while, walking on the beach and freezing, driving by beautiful Victorian houses so Sam could take pictures, and then walking down the pedestrian mall and ending up at a coffee shop called Magicbrain Cybercafe (welcome back to the 90s!) with a little upstairs loft where we sat a while. 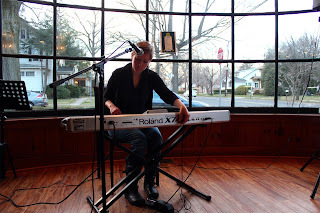 I played my set, having a hard time staying focused because of all the people chatting, saying hi to me behind the piano, and putting cameras in my face. No one seemed to notice though. Allison Tartalia was after me (same bill again!) and then we headed back to the hotel.